Welcome to water coolers sunshine coast, your drinking water specialist. Since 2001 we supply filtered water coolers around Australia. All our water coolers will have a filter bottle, so you can convert your own tap water into great tasting drinking water. Taste freshness like never before - We all know that tap water doesn't have the best taste and contains many chemicals such as chlorine, heavy metals and others. All these chemicals are not healthy and the best is to remove these before drinking. Most filter systems will remove a great portion of the chemicals but not all. 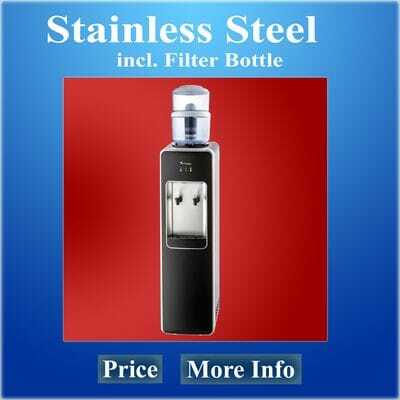 Our filter bottle has a 7-stage filter cartridge build-in. This filter cartridge is one of the most advantaged filter system available in the market today. It not only removes the chemicals, but it will make the water to a more alkaline level and also some very important minerals will be added back to the water as well. We know the importance of drinking the best water for a healthy living so why not start drinking the best water quality with Prestige Water Sunshine Coast today. This is our filtration bottle. It is installed on all our water cooler models. The filter cartridge needs to be replace between the 6 and 12 months depending on the water consumption. Prestige Water will advise you when your filter is due for replacement. The right water cooler for the right location, home or office. You never pay rent on our water coolers, you will own your own drinking water unit. Save money on not having to buy bottled water and paying rent. We sell water coolers and water filters to a wide range of customers throughout Australia from homes, offices, schools, fitness centra, hospitals and more. Choose from our range of water dispensers. If you need more information or need help with choosing your model please ring one of our friendly staff on 1800 500 344 or send an email: email water coolers Sunshine Coast Which Prestige Water cooler is right for you. 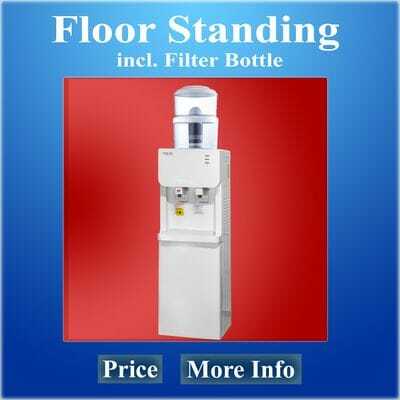 Filtered water coolers are the perfect solution of providing cold, great tasting drinking water for your whole family, staff or customers in waiting area's. We can provide you with high quality drinking water made from your own tap basically for free. Having a full glass of water all the time. The only ongoing cost you will have is 1 or 2 filter changes each year. That is all. 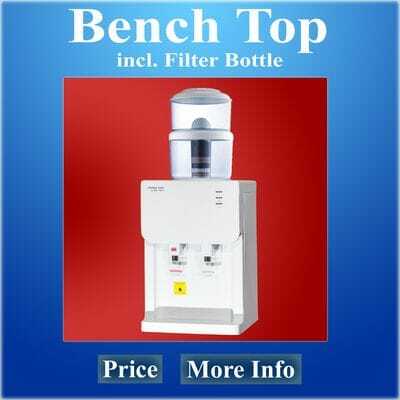 No more to pay and you can enjoy unlimited drinking water and you can refill the filter bottle as often as needed. Better health with Prestige Water. Unlimited free drinking water for yourself, your family and friends, drinking lots of water. Drink water with a mild alkaline pH level, why is water important? We deliver water coolers to Nambour, Marcus Beach, Peregian Beach, Doonan, Weyba Downs, Verrierdale, Peregian Springs, Eerwah Vale, Eumundi, North Arm, Belli Park, Gheerulla, Kenilworth, Coolabine, Cooloolabin, Kiamba, Kureelpa, Image Flat, Kulangoor, Ninderry, Valdora, Yandina Creek, Coolum Beach, Yaroomba, Maroochy River, Cambroon, Kidaman Creek, Obi obi, Curramore, Conondale, Elaman Creek, Witta, Reesville, Wootha, Booroobin, Mapleton, Burnside, Dulong, Towen Mountain, Coes Creek, Flaxton, West Woombye, Woombye, Montville, Huchy, Palmwoods, Chevallum, Landers Shoot, North Maleny, Eudlo, Maneny, Diamond Valley, Mooloolah Valley, Glenview, Bald Knob, Landsborough, Crohamhurst, Mount Mellum, Peachester, Beerwah, Glass House Mountains, Beerburrum, Bli Bli, Rosemount, Pacific Paradise, Mudjimba, Twin Waters, Kiels Mountain, Diddillibah, Kuluin, Alexandra Headland, Mons, Buderim, Mooloolaba, Buddina, Mountain Creek, Sippy Downs, Warana, Birtinya, Wurtulla, Meridan Plains, Currimundi, Moffat Beach, Bells Creek, Caloundra, Golden Beach, Pelican Waters, Coochin Creek, Caboolture, Booroobin, Bellthorpe, Stony Creek, Neurum, Cedarton, Commissioners Flat, Stanmore, Woodford, D'Aguilar, White Patch, Banksia Beach, Bellara, Bongaree, Toorbul, Donnybrook, Meldale, Ningi, Sandstone Point, Godwin Beach, Beachmere, Mount Delaney, Delaneys Creek, Bracalba, Wamuran, Wamuran Basin, Mount Mee, Campbells Pocket, Rocksberg, Ocean View, Mount Pleasant, King Scrub, Moorina, Elimbah, Moodlu, Bellmere, Caboolture South, Morayfield, Upper Caboolture, Burpengary, Dayboro, Laceys Creek, Armstrong Creek, Samsonvale, Kobbie Creek, Mount Samson, Closeburn, Cedar Creek, Yugar, Draper, Samford, Valley, Highvale, Rush Creek, Narangba, Deception Bay, North Lakes, Griffin, Dakabin, Kurwongbah, Whiteside, Kallangur, Petrie, Murrumba Downs, Lawnton, Bray Park, Whiteside, Joyner, Cashmere, Warner, Strathpine, Brendale, Eatons Hill, Albany Creek, Bridgeman Downs, Bunya, Mount Nebo, Wights Mountain, Camp Mountain, Arana Hills.